The next Uptown Swing Dance is on Saturday, September 21. For this month, Uptown Swing will be held at Extreme Dancesport in Cambridge as KI will not be available. Details will be up soon for the Skye Humphries & Naomi Uyama weekend scheduled for November 29-December 1. This will be year number 6 for what has become the annual Skye-Naomi-Gordon weekend. What could be better than a weekend of Lindy Hop workshops with Skye & Naomi, dancing to the Gordon Webster Band, and lots of fun dancers coming together for this wonderful weekend? Always a highlight of the year! We saw all three of them this past weekend and they are looking forward to returning to Boston. Something to be thankful for on Thanksgiving weekend! Check preliminary Skye and Naomi workshop information. Come on out to Uptown Swing this Sunday, August 18 for a fun night of dancing! This month features a special DJ night with guest DJ Stan Yen sharing music selection with your hosts. Ever hear of the Swing Stroll? It is the second Swing line dance (after the Jitterbug Stroll) choreographed by the fabulous Ryan Francois. This one is danced to Nina Simone’s My Baby Just Cares for Me. There will be a mini-lesson during the evening so that you can learn this fun and easy dance! This will be the third and last dance in our Sunday Uptown Swing Summer Series. We’ll be starting earlier in the evening so please note the change of time. Otherwise it will be similar to our usual Saturday night dances! Uptown Swing is held at KI, our awesome venue conveniently located on Harvard Street, just a few blocks from Coolidge Corner in Brookline. (Dance entrance on Williams Street.) There’s AC, a fabulous, huge wood floor, plus free street parking. Beginners are very welcome and there is a Swing lesson included at the beginning of the evening. The music will be excellent for Lindy Hop, Swing and Balboa. You do not need to have a partner to attend. Bring your friends and introduce them to a fun night! September marks a new season of dancing and a great time to get back into class after the summer break. It is also an excellent time for those just getting started. Classes are a great first step to bringing new people into the dance community. Most of our new students come from recommendations and we really appreciate your help to keep our community growing and thriving! Our new class session starts Sunday nights on September 8 in Newton Lower Falls and Monday nights on September 9 at Ruggles Church in Boston (near Fenway Park). There are classes for all levels, no partners required. Beginner Swing/Intro to Lindy Hop Level 1: For those who are brand new to Swing dancing, this is the place for you! Also ideal if you have some experience and would like to brush up on skills and build a repertoire of fun moves. Six count basics will be covered along with a different selection of steps each session providing a foundation of the basic elements of Lindy Hop including rhythm, style and partner connection. 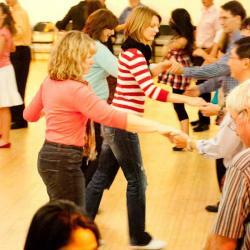 There are 7 different sessions at this level building a good base for social dancing. Level 1 classes may be taken in any order. It is recommended to stay at this level long enough to feel very comfortable before moving to Level 2. Discount after 2 sessions! No experience or partner required. This class meets in both Newton and Boston. Lindy Hop Level 2: Level 2 focuses on the core fundamentals of Lindy Hop, including a mix of 8 and 6 count basics. Emphasis is on technique, partner connection, musicality and building skills. No previous Lindy Hop experience required, although must competently social dance any style of triple-step Swing. There are 8 different sessions at this level which continually change over time and can be taken in any order. Each session includes a range of classic Charleston to newer variations, all with a touch of flash! Discount after 2 sessions. No partner required. This class meets in both Newton and Boston. Wraps, Reversals & Rhythms: Play with partnering, stretch and rhythm changes to find new ways to add variety to your Lindy Hop. Some themes explored will be using wraps, changes of direction and unexpected twists and turns. If you are an experienced Lindy Hop dancer with solid basics and would like to find some new ideas and inspirations, this is a class for you! No partner required. This class meets on Sundays in Newton. Next weekend we’ll be off to ILHC, the International Lindy Hop Championships. This will be the 6th year for this awesome event and our 6th year as Competition Coordinators. The full schedule of competitions and tons of competitors will be keeping us busy! ILHC is a truly international event with competitors coming from all over the world. The atmosphere is friendly, positive, inspiring and uplifting. Besides competitions, there are workshops, excellent bands and wonderful social dancing. We love being part of this fabulous event! Mark your calendar for what has become the annual Skye-Naomi-Gordon weekend, scheduled for November 29-December 1. So wonderful that it just has to be done again! A weekend of Lindy Hop workshops with the always awesome Skye Humphries & Naomi Uyama, plus Saturday night Uptown Swing with the equally awesome Gordon Webster Band featuring Naomi on vocals. Always a highlight of the year. Always inspiring, challenging and fun! Something to be thankful for on Thanksgiving weekend. Information on the schedule and classes will be coming soon. The third dance in the Sunday Uptown Swing Summer Series is coming up on August 18. This month features a special DJ night with guest DJ Stan Yen sharing music selection with your hosts. In case you are wondering what happened to Racky Thomas, he and his band have been postponed to September 21. A new date just added to the fall Uptown Swing schedule! Please note the earlier time for Sunday! 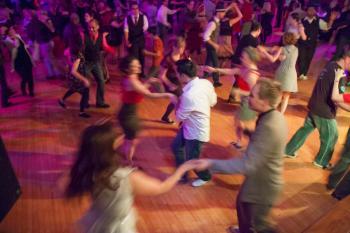 Beginner Swing lesson starts at 6:45pm and dancing at 7:30pm. Uptown Swing is held at KI, an awesome venue conveniently located on Harvard Street, just a few blocks from Coolidge Corner in Brookline. (Dance entrance on Williams Street.) There’s AC, a fabulous, huge wood floor, plus free street parking. Beginners are very welcome! You do not need to have a partner to attend. The music will be excellent for Lindy Hop, Swing, and Balboa. Bring your friends and introduce them to a fun night! Time has flown by since Beantown and we are still working on our follow-up and going through a ton of photos. The spirit of Lindy Hop was alive and well at camp this year! What a fantastic week with so many wonderful moments. Seeing all of the instructors together filling the floor was truly amazing. So much talent all in one place! Seeing it on paper is one thing. Experiencing it in person is another! A great start to the week to come. The cool breezes, the beautiful view, a chance to relax and just enjoy time with other campers. Awesome from start to finish. Listening to Norma rave for a good 15 minutes afterwards was the icing on the cake. She kept mentioning how her spirit had been renewed. What better compliment could there be? Kudos to Evita and Michael and all the performers and crew who contributed to such a spectacular show! I may have seen all the dance clips before, but never with Norma’s off the cuff comments full of interesting information and a participant’s point of view. Priceless! When we added Maduka and Taryn Chidebelu-Eze to our camp staff, we had no idea we were getting such an amazing talent on campus. Taryn treated us to several wonderful performances during the week. My favorite was during Beantown’s Got Talent. Watching her young son singing along with a huge smile and much pride in his face was truly special. The class performances at the end of the week are always a camp highlight, although this year’s were extra wonderful. Rose provided an excellent setting and the audience was the best ever giving a rousing standing ovation after each group. This year we added two special awards, Top Student to Jonathan Chen and Spirit of Lindy Hop to Cynthia Simonds. My favorite part was when Cynthia ran down from the back of the room to hug Jonathan, not knowing that she was soon to be called up for her own award. If that didn’t confirm we made the right choices, I don’t know what would. Thanks to Dave Lasagna for the insight to pass the mic to these two wonderful recipients. If there was anything that brought us all together, it was this moment. This one gets added to the all-time best Beantown moments EVER! Closing out our last dance with Gordon Webster is a guaranteed fun night! The last 20-25 minute version of “I Like Pie, I like Cake” included a sing along, a jam, some unique improvising from Gordon, and even some crowd surfing from Josh Mclean. You couldn’t plan this stuff if you wanted to! Seeing everyone at camp, catching up with friends, meeting new campers, watching everything enfold, seeing the happy faces, feeling the positive collective spirit, having that sense of community. The pure joy is what brought us to Lindy Hop and why we still do it! Thank you so much to everyone who joined us at Beantown this year, everyone who supported us and encouraged others to attend, our amazing staff and awesome crew and every single person who chipped in one way or another. We appreciate every one of you and could not do Beantown without you! In addition, we must send a huge thank you to Patrick and the entire Endicott College staff for providing us such an amazing environment and helping us to have the best camp possible. Beantown Campers, you have once again exceeded expectations! We wish you all the best and hope to see you back in 2014! Come on out to Uptown Swing this Sunday, July 28 for a fun night with Boston Swing Express! The music will be excellent for Lindy Hop, Swing and Balboa. This band gets better every time we see them. They played to excellent reviews at their last one in October and we’re happy to finally get them back. We’ll be starting earlier in the evening so please note the change of time. Otherwise it will be similar to our usual Saturday night dances! We have been having a lot of fun with our Monday class session in Boston this summer. Although we are not quite ready to be concentrating on September, we did want to announce that our new classes are now up and we’ll be back to our schedule of Sunday and Monday classes. The new 6 week session starts Sunday nights on September 8 in Newton Lower Falls and Monday nights on September 9 at Ruggles Church (near Fenway Park). There are classes for all levels, no partners required. Beginner Swing/Intro to Lindy Hop Level 1: For those who are brand new to Swing dancing, this is the place to start! Also ideal for those with some experience who would like to brush up on skills and build a repertoire of fun moves. Six count basics will be covered along with a different selection of steps each session providing a foundation of the basic elements of Lindy Hop including rhythm, style and partner connection. There are 7 different sessions at this level building a good base for social dancing. Level 1 classes may be taken in any order. It is recommended that students stay at this level long enough to feel very comfortable with the material taught before moving to Level 2. Discount after 2 sessions. No experience or partner required. This class meets in both Newton and Boston. Wraps, Reversals & Rhythms: Play with partnering, stretch and rhythm changes to find new ways to add variety to your Lindy Hop. Some themes explored will be using wraps, changes of direction and unexpected twists and turns. For experienced Lindy Hop dancers with solid basics, no partner required. This class meets on Sundays in Newton.